NoteBurner iTunes DRM HD Video Converter:Convert iTunes DRM HD M4V movie rentals and purchases to HD TV. If you are used to purchasing movies from iTunes, you may notice that there is a great amount of HD movies on iTunes Store. From action to comedy, from drama to sci-fi, you can just find almost any movie of its HD version there. 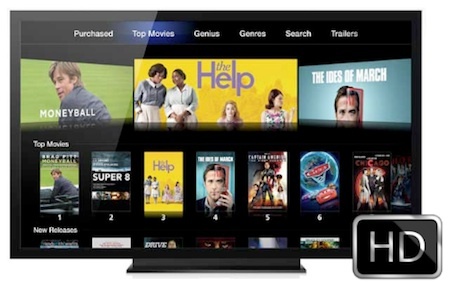 And you may like to download those HD movies so that you can watch them on your HD TV via Apple TV. But if you don't have Apple TV yet, could you watch the HD movies on your home TV? The answer is absolutely Yes if you can unlock iTunes HD Movies from DRM protection. But now you may begin to wonder how to remove DRM protection from movies downloaded from iTunes. Don't worry. It is very easy and fast to remove the DRM protection from the HD movies with one of the best DRM removal tool, that is, NoteBurner iTunes DRM HD Video Converter (For Mac & For Windows). This application has been being in the market for year dedicated to help iTunes users to strip the DRM protection from both iTunes M4V movie purchases and rentals in SD and HD versions and convert the SD/HD M4V to other formats so that you can burn the converted DRM free movies to normal video formars or DVD to play back on your HD TV. 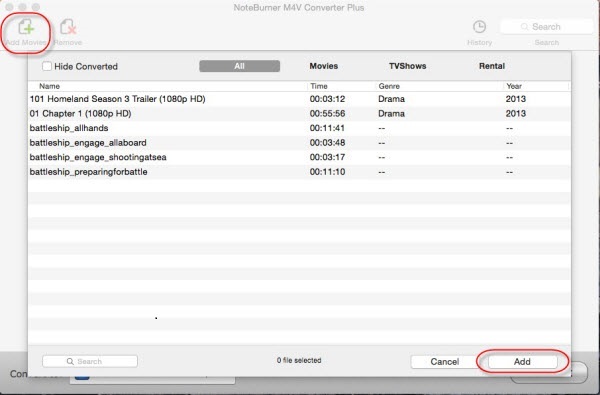 The following is a detailed tutorial about how to convert purchased or rented iTunes movies/TV shows to HDTV using NoteBurner M4V Converter Plus. 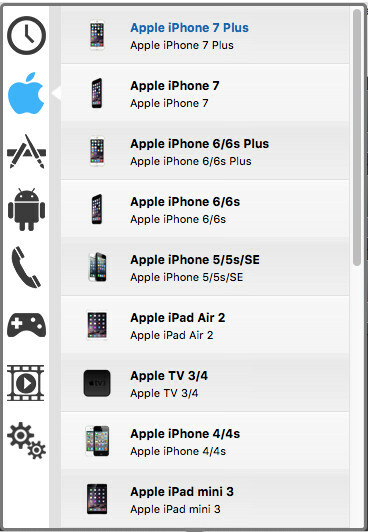 Please download this useful tool on your Mac pc or Windows PC first before getting started. 4. Mac machine with OS X 10.5.8 or higher. Note: If you need to convert iTunes HD movies on Windows, you may need NoteBurner iTunes DRM HD Video Converter Plus for Windows. Download and install the NoteBurner iTunes Movie to HDTV Converter on your PC, then please click the add movie button on the main interface to choose the movies you want to convert from iTunes library. After that, click Add, the files will be successfully imported. To play iTunes movies on TV, you can simply click the format bar and choose "Same as source video for MP4" from the profile list. The quality of the output video will be lossless. 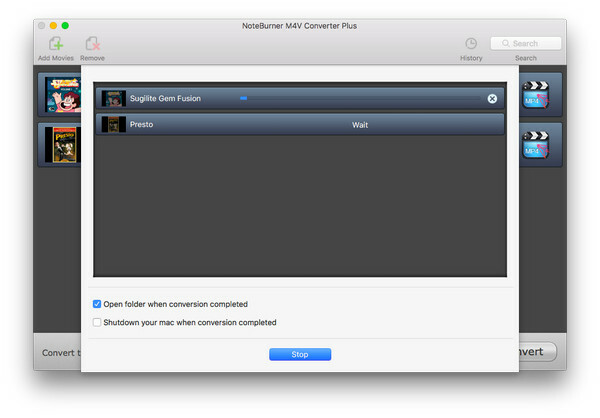 Click the convert button at the bottom to convert iTunes M4V to HDTV supported MP4 video. When the conversion done, you can click to open the output folder to get the converted files and play them right on HDTV from a USB flash drive or DVD Player. Actually there are two levels of HD movies in iTunes. 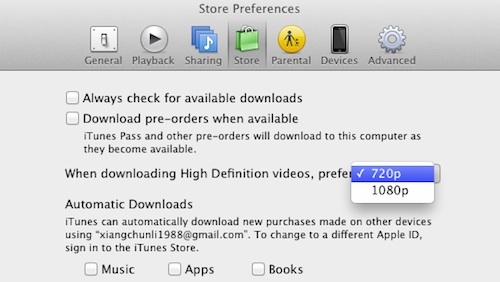 Earlier when iTunes Store started offering content in HD, it only supported 720p. And later it has been upgraded to 1080p. So currently you will find two versions of HD quality for most movies in iTunes. The differences between 720p and 1080p is that the former HD standard offers a 1280 x 720-pixel resolution, while the latter packs in 1920 x 1080 pixels. Needless to say, 1080p images contain more information and more pixels, leading to a more detailed and high-quality image. And yes, it will take longer time to download. 1. Make sure you're running iTunes 10.6 or higher. 2. Open iTunes "Preferences" and click on "Store". 3. Look for the option for "When downloading High Definition video, prefer:" and click the drop-down. Select "720p or 1080p".